The ballots have been counted in the election for one delegate to represent Local 39000 at the TNG Sector Conference and CWA Convention. Juan Ramirez is declared elected Delegate to the TNG Conference and CWA Convention representing Local 39000 for 2017. Daniel Kaufman will serve as the Alternate in the event that Mr. Ramirez is unable to serve. Note: Turnout was 23% of all ballots issued. Results will be released on Wednesday July 5th. On Saturday July 15, we will hold a meeting from 10am – 4pm at the Santa Fe Springs District 9 office. As we move past the problems that led to the Temporary Administration, I hope that members who are interested in helping form the new Local structures will come together. Discussion will include the structures in which we exist (Federal and State Laws; Constitutions and Bylaws of the national bodies and the Local) and how we fit in the CWA, TNG, and Local 39000. Resources available from TNG (Legal Services), and the CWA (Strategic Industry Fund grants and others) programs. The CWA Legislative Political program, and resources that can support our lobbying will be explained as well. Then we can discuss the policies and committees that the Local will need going forward. And Training offered by CWA District 9, as well as training for stewards in the CWA systems. Under your Weingarten Rights, you have the right to ask for union representation in any case where the interview with management might lead to disciplinary action. YOU must ask for representation, management will then wait until a steward is located. You can also call the union office and we can represent you on the phone during a meeting if there is no one in the same office available. 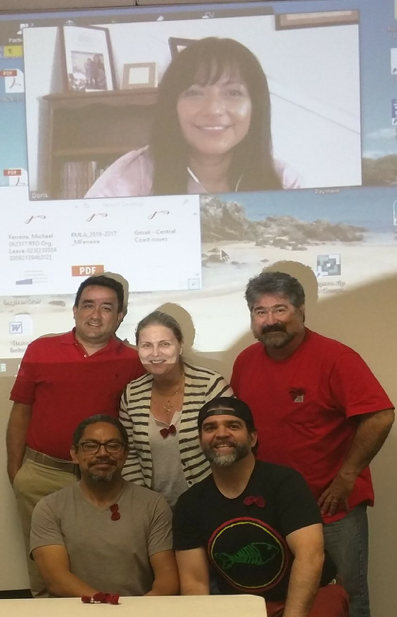 Your Region 1 Bargaining Committee attended a full-day caucus meeting on Friday, June 23 to work on contract proposals with attorney Christine Alvisurez's participation. Using your bargaining survey results, we outlined proposal topics, focusing on issues that members expressed as most pressing. We discussed some of the exciting community-building efforts already underway (read report below). We also identified the need for volunteer leaders to aid with a Watch and Support Committee to take time off to attendupcoming bargaining sessions. We received some beautiful knitted bow tie lapel pins made by some of our colleagues. Production and distribution of the bow ties is being coordinated through the CFI Region 1: Bargaining & Beyond Facebook group. In the coming weeks, community-building efforts will continue. Remember to wear RED every Thursday, wear bow tie lapel pins every day, and get united to support your bargaining committee! was a great success, with close to forty interpreters from CCH, CJC, Metro, East LA and beyond in attendance, many decked out in “Thursday RED”. 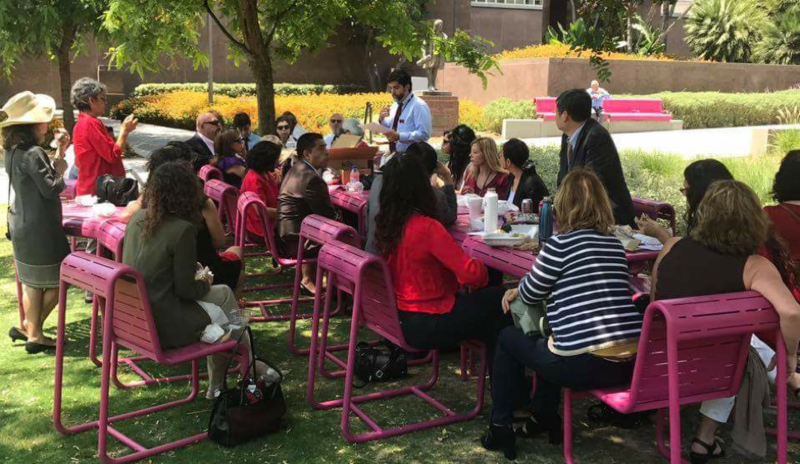 The union provided lunch, and Daniel Kaufman, R1 Bargaining Team member spoke, touching on both the larger context of our bargaining and the specifics of the Bargaining Team’s preparations for the upcoming negotiations. He talked about the bargaining team members and spokesperson, the projected timeline and the importance of any member who had not yet done so, completing the survey to help the bargaining team have an accurate picture of which issues are of most importance to the membership. He also emphasized the importance of member participation throughout the bargaining process, affirming that in addition to the bargaining team’s work, our success at the table is directly related to the level of involvement and support of the membership at large. A lively Q&A followed in which members expressed both hopes and concerns, and discussed some of the ways of getting involved and spreading the word. One of the ways the team is asking members to show support is to wear RED every Thursday, and wear a red bow-tie pin* every day, as a show of support for our bargaining team and to let others know we are in contract negotiations. *The Red Bow-Tie Pin project is the brainchild of the CCH knitters and crocheters, who have been busily needle-working away during lunchtimes and at home to create bright red bow-tie lapel pins to distribute to colleagues throughout the Region. All those inclined to hooks and needles are invited to join in - see CFI Region 1: Bargaining & Beyond Facebook page for simple instructions on both how to make and how to request bow-tie pins. Don’t just rely on the grapevine for information: if you want to be in the loop, get up to the minute updates, hear it from the horse’s mouth - visit the CFI Region 1: Bargaining & Beyond Facebook page. Stay connected: together we are strong. And stay tuned for the next Bargaining Update and Community Building Lunch, coming soon to a courthouse near you! In April, internal union charges were filed against the former officers of the Local (President, VP, Treasurer and Executive Board Members) by two members of the Local. The investigation was assigned to a CWA Staff Representative from Denver (Susie McAllister). She submitted her report to the CWA President Chris Shelton and it has been accepted. It has now been released for members to read and you can find it in the Members Only section of the Memberclicks website. The trial body hearing the case is 3 members of the national trial panel, who have been appointed to hear the case: Kevin Condy, President, Local 1101, Chair; Judy Bruno, President, Local 3406; and Diane Bailey, President, Local 4310. Ms. McAllister will prosecute the case – presenting the evidence that she found in her investigation. The trial will take place at the CWA District 9 offices in Santa Fe Springs on Monday July 17, Tuesday July 18, and Wednesday July 19th. The hearing is open to all members in good standing and will take place from 5pm to 10pm each night (note the case may conclude in less than the allotted 3 nights). The trial body’s ruling will be released to the members after it is submitted to the CWA Executive Board. As you know we are conducting an election for one delegate to represent the Local at the CWA Convention this year in Pittsburgh, the TNG Conference will take place in the days ahead of the Convention. We have two candidates, and the runner-up will be the alternate in the event of the inability to serve. We are using Ballotbin to conduct the election – and the email sent to all members in good standing came from that company. If you have not seen your email (it went out a week ago) with your link to vote, please contact Monse [email protected] so that we can help you look in your spam filter or see if we need to use another email address for you. Ballots must be submitted by July 4th and will be counted on the morning of July 5th. For those who need a physical ballot, the deadline will July 3rd in the office so that we can count them all on the morning of July 5th. The Convention is the highest decision-making body in CWA and can overrule the CWA Executive Board/President. Our parent union is very proud of their democratic roots, and hold their conventions every 2 years. Please cast your ballot for delegate. Registration will be opening soon, we will be holding registration prices to those from 2014. The report on the Temporary Administration has now been released. You will find it posted under the members only section. Reminder: Those interested in being delegates to the TNG Sector Conference and the CWA Convention should email their interest in the next day or two - as nominating petitions and candidates statements are due by Friday June 16th. Finally, members in Region 1 should be filling out their bargaining and interpreter surveys. The Region 1 Bargaining Committee is collecting information, and preparing to draft proposals, and they will appreciate your input.